With a host of new films set during World War II about to hit Russian screens, Stephen Norris takes a look at how American and Soviet movies established particular narratives during the Cold War and how they continue to inform contemporary films. After the end of World War II, the two superpowers produced two different narratives about the conflict, how it was fought, and how it was won. In 1949, Allan Dwan’s “The Sands of Iwo Jima,” starring John Wayne, established the paradigmatic version of America’s war in the Pacific. Wayne’s Sergeant Stryker is an authoritarian leader of his squad and initially hated by his men. As they fight for Iwo Jima, however, they come together as a unit and appreciate Stryker’s methods. Stryker is shot by a Japanese sniper and dies just as his men take the hill and raise the American flag over it. His sacrifice allows his men to continue the fight and to win the war. “The Sands of Iwo Jima” premiered just four days before Joseph Stalin’s 70th birthday in 1949. Mikhail Chiaureli’s present to the Soviet leader, “The Fall of Berlin,” was released in two parts in early 1950. The film follows Alyosha, a Stakhanovite steel worker who is in love with a teacher named Natasha. When the Nazis invade, Alyosha is knocked unconscious in an air raid and falls into a coma. He recovers, fights his way through the Soviet Union and then to Berlin, where he helps to raise the Soviet flag above the Reichstag. The hero of the film, however, is Stalin: the Soviet leader guides his people to victory and even arrives in Berlin to help Alyosha find Natasha again. While “The Sands of Iwo Jima” established certain parameters of American movies about the war, culminating in the onscreen flag-raising over Iwo Jima, “The Fall of Berlin” did the same for Soviet cinematic narratives, culminating in the flag-raising over the Reichstag. After Stalin’s death, Soviet films stripped away his wartime significance, and continued to focus on the sacrifices Red Army soldiers made to defend their motherland. In the late 1950s and early 1960s, a series of Soviet movies, including Mikhail Kalatozov’s 1957 “The Cranes are Flying” and Sergei Bondarchuk’s 1959 “Fate of a Man,” captured the humanistic elements of the war even while reaffirming that the defense of the motherland, culminating with the victory at Stalingrad, served as its turning point. At the same time, American movies were dominated by action-adventure vehicles — often co-produced with British companies — such as J. Lee Thompson’s “The Guns of Navarone” (1961), Don Siegel’s “Hell is for Heroes” (1962), Robert Sturges’s “The Great Escape” (1963), Robert Aldrich’s “The Dirty Dozen” (1967), and Brian Hutton’s “Kelly’s Heroes” (1970). Most of these films, along with epics such as “The Longest Day”, established D-Day as the turning point in the war. They all tended to tell the war as an action story involving a group of rag-tag soldiers coming together to accomplish a mission that contributes to the overall victory. These Hollywood interpretations of the war did not sit well with Soviet critics: In a 1963 Iskusstvo Kino review of “The Longest Day”, Lev Ginzburg concluded that it was an attempt to use the Second World war in order to legitimize NATO’s Cold War policies. The Cold War, in short, provided the context for the two film industries to construct two distinct memories of World War II and to understand the other’s movies. By and large, American movies focused on the Pacific Theater or on D-Day and the liberation of France or Italy. Soviet movies almost exclusively focused on the reaction to the Nazi invasion, the heroic defense of the motherland, and the victory won at Stalingrad that led to Berlin. These narratives should come as no great surprise, yet the unintended consequence was that movies about World War II had the effect of justifying the Cold War. The war could no longer be imagined as a shared experience. 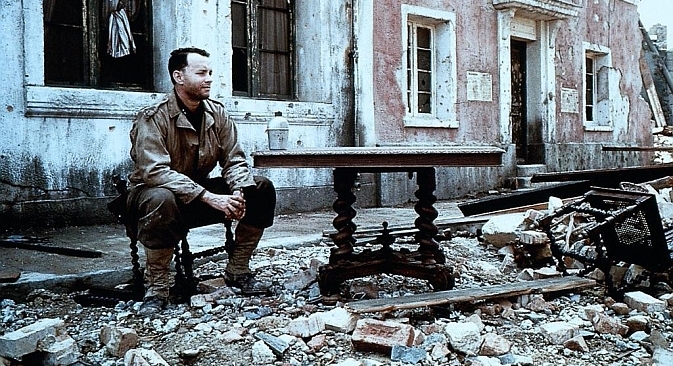 Steven Spielberg’s 1998 global blockbuster, “Saving Private Ryan,” would help to bring about a renewed dialogue between American and Russian films. In addition to the acclaim it received, Spielberg’s movie generated a lot of discussion in Russia. Karen Shakhnazarov, the head of Mosfilm Studio, criticized “the American films with their own evaluation of the war constantly thrust upon us” and called for renewed Russian movies about the war. The subsequent return of the war to Russian screens — both large and small — has had some notable moments, particularly in films that explore subjects deemed taboo during the Soviet era. Nikolai Dostal’s acclaimed 2004 TV serial “Penal Battalion”, brings to light the neglected story of Soviet citizens forced to fight as cannon fodder, but does so by reaffirming that “ordinary” men and women defended their motherland. This timeless value, combined with a willingness to sacrifice oneself for the victory, is also at the heart of Fedor Bondarchuk’s 2013 blockbuster, “Stalingrad,” which became the highest-grossing movie in Russian history. American films, from the critically lambasted blockbuster “Pearl Harbor” (2001) to the hugely successful HBO series “Band of Brothers” (2001) and “The Pacific” (2010), have also continued to operate within the frameworks established during the Cold War. Even films that introduce new elements — John Woo’s “Windtalkers” (2002), which focuses on the role of Navajo code talkers in the Pacific and Spike Lee’s “Miracle at St. Anna” (2008), which narrates African-American contributions to the war in Italy — do so by sticking to established paradigms. Perhaps the clearest sign that war movies have established fixed narratives in both countries can be detected in two recent films, one from each country. Quentin Tarantino’s “Inglorious Basterds” (2008) is not meant to be a historical film at all. Even in these films, however, Americans are still liberating France and Soviets are still headed to Berlin. Stephen M. Norris is Professor of History and Assistant Director of the Havighurst Center for Russian and Post-Soviet Studies at Miami University (OH).